Sometimes, when I issue a Post, the message just seems to resonate or touch one or more of the “Friends” in a personal way and causes a response. Last week’s Post brought about a higher than usual number of positive comments. I sincerely invite anyone to correspond with me in any of several ways available. This Blog provides a “Leave a Reply” option to send a note and my email address is provided. atbroady@aol.com. I said last week, so much of this is “beyond us” as far as what has been accomplished to date. Fortunately, what has been achieved did not stop where our own limitations ended…but extended “beyond us”. If you feel like talking back to me…send me a note. THANKS! I promised to introduce you to the volunteer teachers we have working at the Learning Center at this time. Folks…we have useful and talented people at the Leaning Center! First, Jessica Skelton was born and raised in Austin, Texas. She attended Texas State University from 2011-2015 and graduated with a major in Interdisciplinary Studies with an Early Childhood through 6th grade ESL generalist certificate and a minor in Spanish. For the past four years she has worked for an Austin-based nonprofit called Girlstart. In addition to her experience teaching at Girlstart, she has also taught 4th grade and 2nd grade each for a semester in Austin. Her hobbies include practicing Spanish, yoga, and hiking. I’m finding that there are plenty of opportunities to do all of these things in Copey! From my perspective, it is very beneficial to have a volunteer who has familiarity with STEM and can inspire young female students at the Learning Center to pursue educational opportunities related to STEM. Also, Roberto Luis Varona is on board from Manila, Philippines. He studied at an American Jesuit School and received his BA Degree in Economics in 1972. He then obtained his Masters in Public Administration at the University of the Philippines. Later, his family emigrated to Vancouver, Canada, where Roberto worked as an Urban/Regional Planner, and eventually as a Human Resource Specialist for the British Columbia provincial government. From 1977 to 2003, he helped raise a family of one girl and two boys. He claims his lust for travel resulted in his international career as an ESL teacher. Just prior to arriving in Copey, Roberto spent 6 months in Popayan, Colombia and a total of 3 years in Latin America teaching English as a Second Language (ESL). Prior to the last three years, Roberto was in China teaching ESL. He calls Copey a Central American paradise! I have met both Jessica and Roberto via Skype and I believe the final two months of school will be both exciting and successful. I have consistently been impressed with the volunteers I have become acquainted with or aware of after “Friends” became involved. 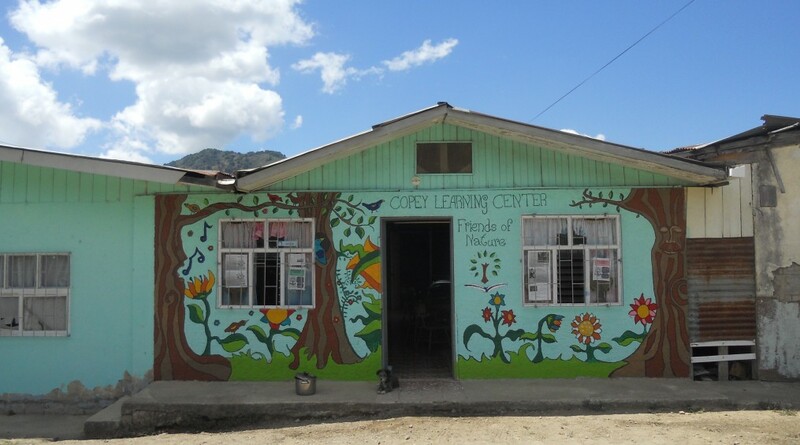 The backgrounds of those arriving at Copey to devote part of their time and talent in support of the mission of the Learning Center is highly commendable and shows the level of commitment the community and the Learning Center has to education. This past weekend I attended a conference and found my time associating with friends and colleagues very refreshing and enjoyable. I thought it would be a brief break from my daily routine which includes the ongoing and constant tasks associated with “Friends of Copey”. There are times when just getting away provides an opportunity to step back and get a better grip on things. The guest speaker at the conference was Rev. Dr. Shirley A. Perry. She has a very interesting and impressive resume covering her career in both Christian Ministry and Music Ministry. She presented a compelling message about having faith in the impossibility. Her message challenged us to “embrace the limitlessness” of God (the Holy Trinity) because God can and does perform beyond the constrained or restricted limits we humans tend to place on ourselves. With God…all things are possible. Rev. Dr. Perry’s message was taken from John 11 and is a familiar story of two sisters praying for the impossible to happen and believing their prayers would be answered. The sisters embraced the unlimited ability and power of prayer. As I listened, this message hit a nerve and my temporary weekend break from “Friends of Copey” suddenly ended. The message took me straight back to that place I thought I left at home. “Friends” are familiar with my mantra about praying. It is always first on my list for call to action. “Friends of Copey” has no membership dues, no fees, and no financial obligations. We simply place our faith in believing that what we do will be useful, meaningful, and beneficial to those students at the Learning Center. This is our prayer. Blogging offers many benefits. It provides a detailed record of “Friends” involvement, goals, and a history of accomplishments. This public record stands open and available to whomever is inclined to access the web site at www.friendsofcopey.com. Today, there are more than 140 Posts available for review and provides convincing evidence of the “beyond the limitlessness”. Surely, some will claim I am overstating our work and achievements. I understand the need to do so. At times it is just too difficult to evaluate how much impact we have on a community so far away. For those not too impressed, look into this further by contacting the Learning Center for yourself. You will find that “Friends” is highly respected, highly trusted, and highly regarded for our demonstrated commitment and service to the Learning Center and the community. To consider what has been done over three short years as something anyone could do without calling on Deity, the help of positive thinkers, generous givers, and answered prayers…is thinking foolishly. Director did not exist. These things do exist now and recently, we even witnessed US college students traveling to Copey to work as volunteers at the Learning Center. Then, Learning Center students spent time in the US. These things just did not happen and I freely give credit to many who pray and who believe what we do is a Blessing in the works. A blessing that takes us all far beyond limits of our own capabilities. A while back, a “Friend” (Carolyn B.) spoke about her regrets that she could only pray and was not financially able to support “Friends of Copey”. I provided her a very easy response. Pray that others who may be capable and inclined will chose to donate. When I see a donation come in, I believe it is because of Carolyn (or you) praying. It works!!! Money is important at times but not the center piece of our interest and involvement. When we need the money…it shows up. So keep praying! In closing, I realize this Post is different from most I write. However, Rev. Dr. Perry struck an inspiring nerve and hit me right in my heart. In my opinion, many “Friends” have yet to embrace the fact that with prayer there are no boundaries and no limits on what can be done. Not many envisioned “Friends” ever getting this far. Even in Copey there has been non-believers. Many in this very small community could not imagine two young ladies attending the Learning Center, a 15 and an 18-year-old, would have the great fortune to visit America. Today, these non-believers are “big” believers that possibilities do extend beyond their limitations and have begun to “embrace the unlimitlessness”. As the spiritual song goes…“We have come a mighty long way!” May God Bless! Another fast week just passed and locally kids have all returned to school. Local football games are underway and there is the noticeable change in both the temperature and the time the sun rises. All of this points to the Summer being all but over. In fact, yesterday we celebrated Labor Day which for many is the official end to Summer. Labor Day, celebrated annually on the first Monday in September is a holiday to recognize the labor movement and is dedicated to the social and economic achievements of American workers. It is our country’s tribute to the contributions workers have made to the strength, prosperity, and well-being of our country…according to our own US Department of Labor. It seems like a strange holiday in some ways. Would it not make as much sense if workers and even non workers performed some kind of labor or community service instead of taking the day off we recognize for “labor”? Well, in actuality “everyone” does not have the day off…many still have to show up for work such as police, medical personnel, those in the hotel or travel industry, and of course our military. In Costa Rica, Labor Day also known as May Day, is recognized and celebrated on May 1st. Therefore, the Learning Center was open for business yesterday. I mixed some fun and work on my Labor Day by working on my weekly Post which I finished this morning. In the world of “Friends of Copey” almost everyday is a work day and I approach each task with both dignity and honor. As “Friends” I believe we are privileged to be in a position to impact young lives by our combined efforts. Today, there are many things in the works. I am still unable to share a couple of the activities that are still in the very early stage of development. However, there are other actions underway. I am getting ready for an important Kiwanis Club presentation on October 14th regarding the progress (in 2016) of “Friends of Copey”. Then, we are gearing up for the REI fund-raising event scheduled for October 15th and 16th. These are the next two most significant “Friends” events on our schedule designed to promote and support the Learning Center. Other activities include getting our Pen Pal programs activated with the start of school in our area. During last week’s Skype session, Ana reported an additional 15 students are being enrolled into the Learning Center this week setting a new high of 60 plus students for the enrollment count. This is very significant for two main reasons; First, there is apparent growing recognition, increased need and demand, and confidence in the work the Learning Center is conducting. And, with the additional students, there will be greater demands placed on educational resources, classroom space, and personnel support. On a more personal note, in early October there will be a marker dedicated in honor of our ancestor John Broady and other slaves. These men were present during the famous battle held at Kings Mountain in South Carolina on October 7, 1780. This battle proved to have had a significant impact on the final outcome of the American Revolutionary War and the future of our country. There is much to share about John Broady but we will do this at another time. It is an honor for us to be invited and included in this dedication ceremony. We thank the Daughters of the American Revolution and Ms. Loretta Cozart, Chapter Regent of the Colonel Frederic Hambright Chapter, specifically for leading the way in getting these men recognized during the 100th Year Celebration of our National Parks. It is because of Ms. Cozart’s tireless and devoted efforts that these men will be honored and included in the historical records of the Battle of Kings Mountain and recognized as African-American Patriots.